I have had these beautiful plants (about 14 of them) sitting in my back yard in containers for a while. I got them pretty unexpectedly because I found someone who was selling them at $2 a piece (OMG!!!). You read that right, $2 dollars for one gallon and a half size plant. The truth is, I had gone there not knowing how many I would want to bring home and this very sweet old man said he had 14 so I decided to just grab them all. I forgot to bring a plastic cover for the floor of my trunk but he was so sweet and brought a large piece of plastic so I don’t end up with all that soil in my car. Ok, so this is a very old photo of the front of my house (6 years old) because I forgot to take a photo of it from a far when I was taking photos for this blog post – go figure. But you will get a feel of the size of my lawn which is approximately around 25’ x 40’. 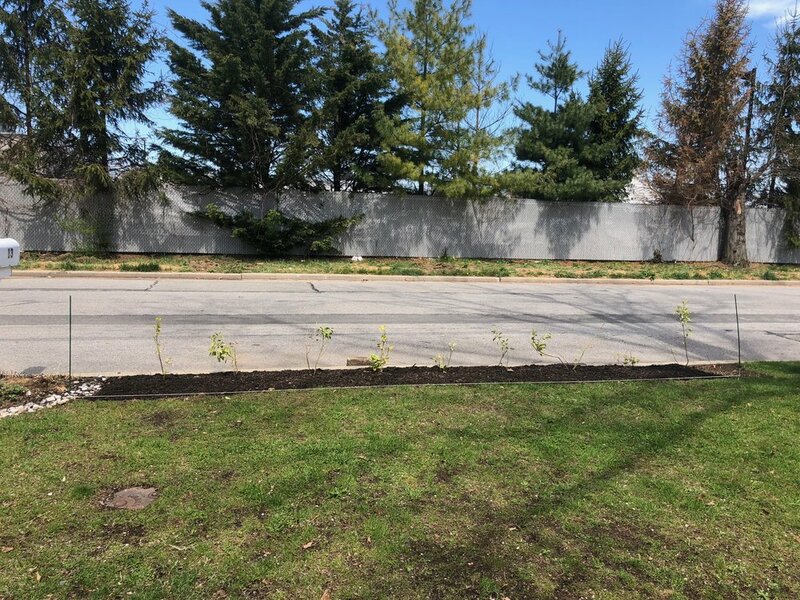 Because I wanted these gorgeous plants to be visible, ok ok I wanted to show of (I still do, so don’t judge me), I have decided to just create a low hedge alongside the street side of my lawn, because my final lawn goals are kind of insane. (more on that in another post). Let’s talk about Golden Euonymus a bit. It is very easy to care for Golden Euonymus. Super low maintenance. They do require a little attention in the first year they are planted until the root system has established. Again, if you want a nice and uniform hedge, then annual pruning is a must to keep them at check and contained. If left to grow freely , they may outgrow their space they were intended to. I had lawn turf in the spot where I intended to plant the euonymus hedge so the first step was to remove the turf. I had 14 plants so after measuring the length on the area which came to be 20 feet long, I could only fit 9 plants with 2 feet between each. I decided to leave only 2’ between plants because I want a tight hedge. I placed 2 tomato stakes on each ends of the area at the 30 inch mark from the curb. I felt that 30 inches would be a nice width because it is easy to mark half way which is 15 inches and that is where the actual plant would go in. After placing the tomato stakes on each end on 30 inch mark from the curb , I took a kitchen twine and tied it on the bottom of each stake so I could have a very straight line to follow with my shovel. If you had a garden edger then that’s awesome, but ultimately it isn’t necessary. It was a bit labor intensive to cut through the grass and remove the turf but nowadays there are tools you can use for that as well but I only used my good ol’ shovel. After I was done with that, I took a rake and a hoe and turned the soil well and made sure I leveled it with the curb. I know my soil quality pretty good so I didn’t need to test it but you can opt for that if you know your soil is bad. This will help you choose the right fertilizer later on. In addition I did buy a few bags of Miracle Gro garden soil so before I placed the root into the hole I dug , I mixed in a bit of that good soil. Anyway, I took my measuring tape and marked 2 feet from my mailbox area and then marked the 15 inch halfway mark. I dug a hole twice as wide and deep than the root of my plant which Is important so the root can have enough room to establish itself. I continued until all 9 of my plants were planted ,periodically checking if I was keeping a straight line, which I was. It was a one afternoon project and I am happy how it came out. After it was all said and done, I just took a rake and leveled the soil and covered it with 3” of fresh black mulch I picked up from the local Home Depot. Tadaaa ! It is all done. I am quite happy how this turned out. I will most definitely update this post as my plants continue to grow and how the hedge will gradually fill in the gaps so stay Tuned ! Let me know in the comments below if you would try such a project yourself and if you did, share some photos so I can see your hard work.